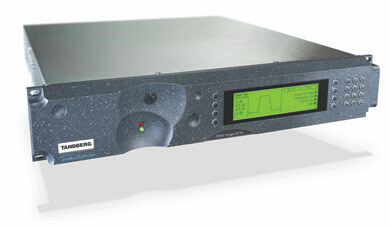 The E5714 can be deployed within DSNG systems requiring either L-band or IF modulation output in a 1RU chassis. It is suited to a variety of applications from low data rate fly-aways to high bandwidth multi-channel SNG trucks. It features a premium MPEG-2 encoder, and L-band versions offer an advanced DVB-S2 capable modulator as standard. When combined with our 2-year Voyager warranty and automatic membership of the TANDBERG Television Advance Loan Scheme, the E5714 offers the best performance in the most space efficient package, backed up by the very best in after-sales support. 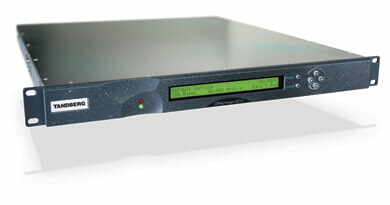 The E5740 can be deployed within Digital Satellite News Gathering (DSNG) systems requiring either L-band or IF modulation output in an upgradeable 2RU chassis. It features a premium MPEG-2 encoder and advanced DVB-S2 capable modulator, providing outstanding bit-rate efficiency, especially when used in combination. The range of upgrade options are a major feature of this product and include options to add MPEG-2 HD, MPEG-4 AVC HD or SD as well as extra audio, MPEG multiplexing, and much more. The E5740 is incredibly easy and intuitive to use and is protected by a standard 2-year Voyager warranty and automatic membership of the TANDBERG Television Advance Loan Scheme. The E5740 therefore excels in every area; performance, upgradeability, ease-of-use and after-sales support. Developed by the market leaders in Digital ENG and SNG systems, the E5750 combines leading video encoding technology with the very best field proven COFDM modulation. It couples a fully flexible, world-class MPEG video encoder with a DVB terrestrial modulator. This allows services to be transmitted terrestrially, without the need for a satellite. It is also possible to add a satellite modulator to the E5750 enabling it to provide a DSNG and DENG solution within a single box. The E5750 is normally used as the central component of a city-wide coverage system using non-line of sight microwave transmission. TANDBERG Television is the leader in providing these systems which are now successfully in operation in many major cities around the world. These systems require only a small vehicle, are quick and easy to set-up and can transmit from virtually anywhere within the coverage area without the need for line of sight visibility with the receive site. The E5784 and E5788 are both premium quality MPEG-2 HD DSNG encoders that can be used in a variety of HD applications, from news gathering to covering world-class sporting events. The major difference between these models is MPEG-2 HD 4:2:2 encoding, which is standard on the E5788 but optional on the E5784. Both models are otherwise identical and feature the latest DVB-S2 capable L-band or IF satellite modulator card as standard. A range of option cards is also available, including Remux, which adds the power of an MPEG multiplexer to the box. Offering SD and HD MPEG-2 encoding modes, the E5780 series of DSNG encoders is ideal for operators needing a space efficient, flexible solution that is highly upgradeable. A 2-year Voyager warranty and automatic membership of the TANDBERG Television Advance Loan Scheme completes the package and provides the very best in after-sales support. 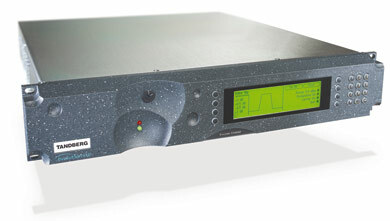 The EN8040 is TANDBERG Television’s second-generation MPEG-4 AVC SD/HD DSNG encoder. 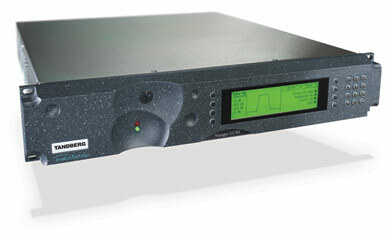 Building upon the success of the award-winning EN5940, the EN8040 provides a multi-format encoding platform combined with an advanced satellite modulator. This combination provides the ultimate picture quality at the lowest bit-rates and transponder bandwidth and with new improved low latency. Backed up by the TANDBERG Television Voyager Advance Loan scheme, the EN8040 is the ultimate companion for contribution & distribution and DSNG wherever you are in the world. For flexibility, the EN8040 can offer MPEG-2 SD, MPEG-4 AVC SD and MPEG-4 AVC HD video encoding. The MPEG-2 and MPEG-4 AVC encoders can be used simultaneously and support low latency modes for delay critical applications. BISS, RAS and DVB-S2 QPSK and 8PSK/16APSK are license key enabled options. Hardware options include a COFDM modulator, Gigabit Ethernet card and advanced audio option card. Most customers can upgrade their existing DSNG equipment (either E574x or E578x products) to EN8040.